This summer has definitely been a bit of a blogging challenge for me. We welcomed our third little girl in May and kicked off our wedding season at the same time. I am trying to circle back and blog a few sessions we did over the past couple months. And this session was SO MUCH FUN!! 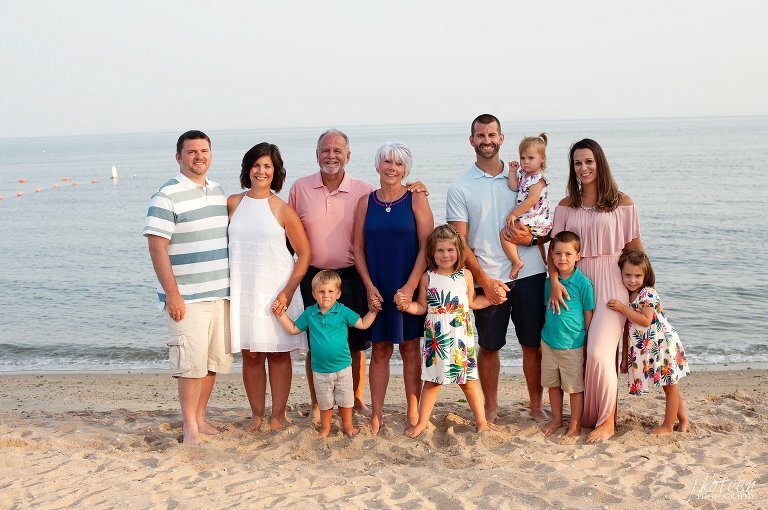 This is the third year that we have headed down to the beach to capture this awesome family. We photographed a family wedding and have stuck with everyone since then. We watched the family grow starting with the first granddaughter through all five now. Each year the kids get more and more fun to capture. Each year it has become tradition to start with the formality and then get to the crazy fun. While it isn’t always easy to keep 5 kids focused and on the same page, they all did amazing. I love seeing the interaction between the cousins. They love being together and playing on the beach. It is so sweet to watch. Once we got all the group photos completed, we were able to take advantage of the evening light and warm weather to capture some candid fun. It is now tradition to let everyone jump in the water in all their clothes. The kids have such a blast, and it always creates some adorable moments. We hope you enjoy this family session as much as we did. We can’t wait for the next one!